Interstate 465 is a complete beltway encircling much of Indianapolis, Indiana. The freeway is mostly suburban, with major widening projects undertaken along the East Side in the late 90s and early 2000s and along the West Side (Accelerate465) between 2009-2012. With expansion up to eight lanes, reconstruction also modernized the freeway in both the Park 100 and the Allisonville / Castleton areas. 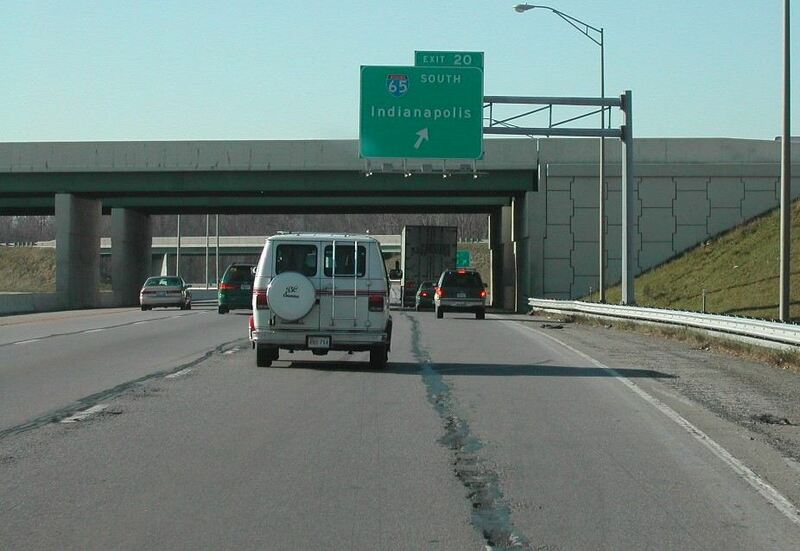 All U.S. highways and state roads were removed from surface streets within the Indianapolis Beltway over the course of the 1980s and 90s. This created a numbering headache as U.S. 31, 36, 40, 52, 421 and Indiana 37, 67, combine with the 53 mile long freeway loop at some point. 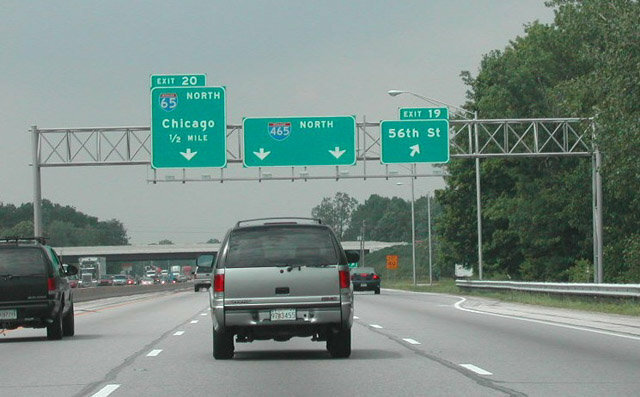 Overlapped routes are generally not signed however, with signs solely referencing either I-465 or I-74/465 along the south side of Indianapolis. Guide signs and trailblazers reference the continuation of each respective U.S. route or state road at the Beltway entry points. I-465 did not directly replace all of SR 100, as a portion of the route remains along Shadeland Avenue. The expressway branches north from I-465 at Exit 48 to Warren Park. This freeway was decommissioned as a state road in 1999. 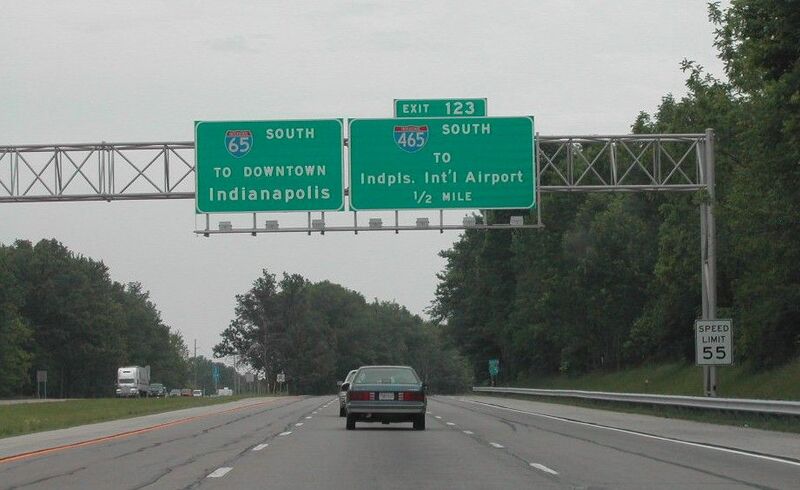 Prior to 2002, Interstate 465 was also signed along the northwestern spur linking the Indianapolis Beltway at Zionsville with I-65 at Royalton. Locally known as the Dog Leg, this connector was renumbered as Interstate 865. Two lanes depart at the left exit from I-465 north to Interstate 65 north to Traders Point in northwest Indianapolis, Lafayette and Gary. Photo taken 11/05/09. For additional photos from this perspective, see the Interstate 465 Inner Loop (Speedway to Castleton) guide. A loop ramp joins southbound Interstate 465 with I-65 south at Exit 20. I-65 angles 17 miles southeast through Downtown Indianpolis between the two exchanges with the beltway. I-465 advances south four miles to combine with Interstate 74 east at Speedway. Photo taken by Thomas Decker (12/17/11). For additional photos from this perspective, see the Interstate 465 Outer Loop (Castleton to Speedway) guide. 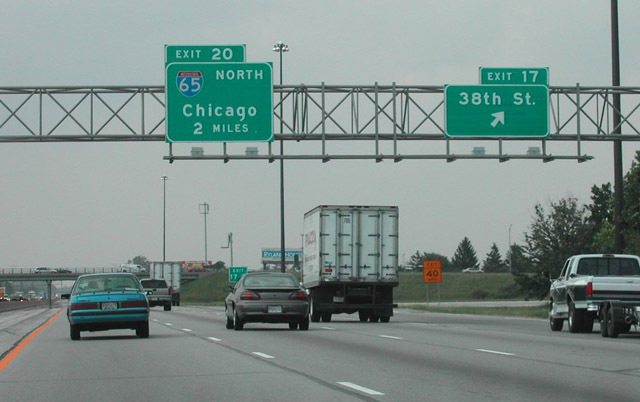 A wye interchange links Interstate 65 southbound with I-465 south at Exit 123. I-465 leads south from Eagle Creek Park to Speedway and Interstate 70 by Indianapolis International Airport (IND). Photo taken by Thomas Decker (05/14/12). 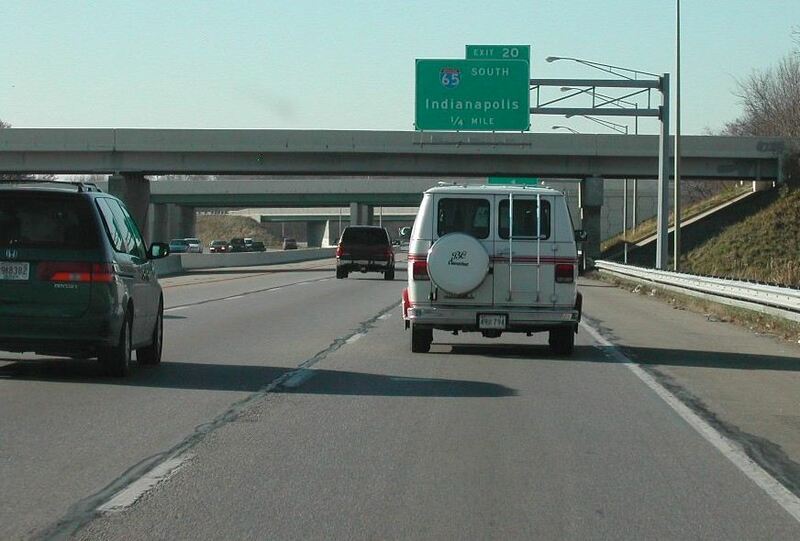 For additional photos from this perspective, see the Interstates 65 South – Indianapolis guide. Interstate 65 converges with I-465 one mile north of the 52nd Street overpass. Photo taken by Brian Dowd (11/29/02). Lafayette Road (old U.S. 52) runs along the east side of Interstate 65 leading to the partial exchange with Interstate 465. There is no connection to the beltway southbound at forthcoming Exit 123. Photo taken by Brian Dowd (11/29/02). Exit 123 links Interstate 65 northbound with I-465 north to Park 100 and Carmel . Photo taken 11/05/09. 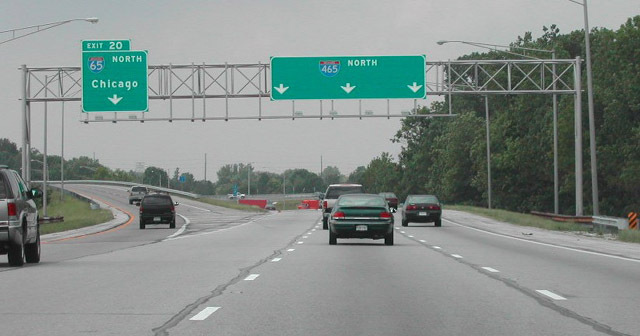 Interstate 465 at the partial exchange with I-65 prior to the Accelerate 465 reconstruction. Photos taken by Brian Dowd 05/31/02, 06/02/02 and 11/29/02. 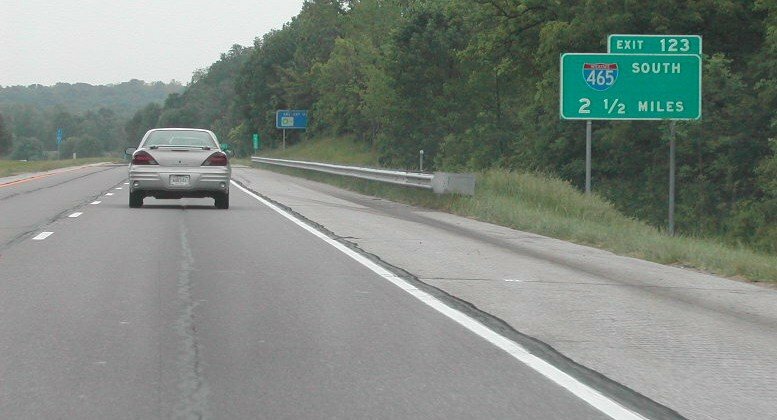 These button copy signs for Interstate 65 remained in service along I-74/465 east into 2018. Photo taken by Brian Dowd (05/31/02). I-74/465 east at the Keystone Avenue overpass, a half mile out from the the directional-cloverleaf interchange (Exit 53) with Interstate 65. Photo taken by Brian Dowd (05/31/02). Interstate 65 leads north into Downtown Indianapolis and south to Columbus and Louisville, Kentucky. Photo taken by Brian Dowd (05/31/02). Older overhead at the loop ramp (Exit 53B) for I-65 north. A $19.6 million project rebuilt six spans at this exchange, including the I-65 mainline. Work finished in November 2017 after nine months.2 Photo taken by Brian Dowd (05/31/02). I-74 & 465 wrap around the southeast side of Beech Grove to the SPUI (Exit 52) with Emerson Avenue. The exchange with Interstate 65 follows in 1.5 miles. Photo taken 11/05/09. Exit 52 leaves the Indianapolis Beltway west for Emerson Avenue at Beech Grove. Forthcoming Exit 53 links I-74/465 with I-65 north by the University of Indianapolis to Downtown and south 100 miles to Jeffersonville. Photo taken 11/05/09. Passing through the diamond interchange (Exit 107) with Keystone Avenue, one mile ahead of I-74/465 on I-65 south. Photo taken by Thomas Decker (05/14/12). An auxiliary lane opens from the Keystone Avenue entrance ramp to Exit 106 with Interstates 74 & 465. Photo taken by Thomas Decker (05/14/12). All traffic for the Indianapolis Beltway departs in unison at Exit 105 for the I-74/465 overlap west to Speedway and east to Beech Grove and Five Points. Photo taken by Thomas Decker (05/14/12). Traffic partitions from Interstate 65 south for westbound I-74/465 to the West Side of Indianapolis and Crawfordsville and eastbound to Lawrence and Cincinnati, Ohio. Photo taken by Thomas Decker (05/14/12). Former overheads at the Edgewood Avenue overpass for I-74/465 (Exit 106). A new sign bridge was added here during 2014-15 widening of I-65 to eight lanes here. Sound walls were also installed. Photo taken by Chris and Amber Lokken (04/07/08). The speed limit reduces to 55 miles per hour on the half mile approach to the Indianapolis Beltway (Exit 106). The Highgate subdivision was developed in the formerly vacant land east of Interstate 65 here in 2018. Photo taken by Chris and Amber Lokken (04/07/08). A lane drop occurs along I-65 north for I-74/465 east at Exit 106. Arrow per lane (APL) signs were added ahead of the old button copy overhead at Thompson Road during the 2014-15 freeway expansion. Photo taken by Chris and Amber Lokken (04/07/08). 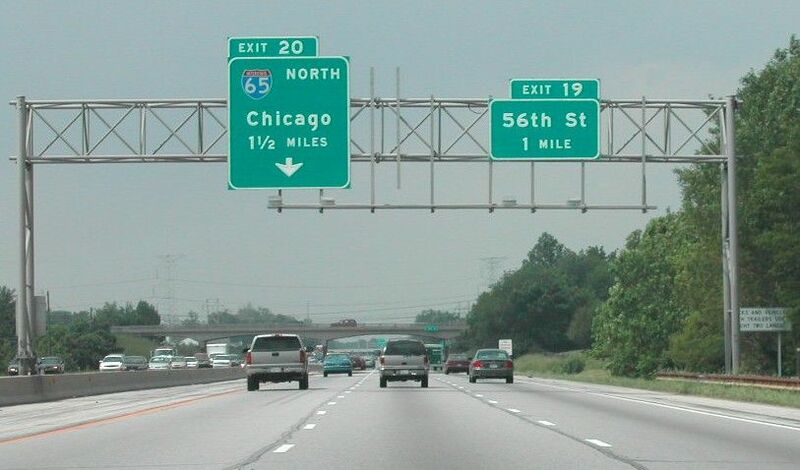 Exit 106 separates from Interstate 65 north for I-74 and I-465 six miles south of Downtown Indianapolis. I-74 circumvents the city center along I-465 west to Speedway and east to Five Points. Photo taken by Chris and Amber Lokken (04/07/08). Exit 106 splits into ramps for the Beltway west nine miles to Interstate 70 near Indianapolis International Airport (IND) and east through the city of Beech Grove. The ramp for I-74/465 was expanded to two lanes. Photo taken by Chris and Amber Lokken (04/07/08). Rebuilding Six I-65 Bridges at I-465 South. Indiana Department of Transportation (INDOT), project web site. Accessed February 6, 2019. Page updated February 6, 2019.